Podiatrist and Chiropodist Juliette Mellors obtained a BSc (Hons) Podiatry degree from Plymouth University in 2006. She is a member of The Society of Chiropodists and Podiatrists and the Health & Care Professions Council (Member No. CH 30621). Our aim is to provide a complete, professional and friendly podiatry service to our clients in Swindon and the surrounding areas. What is the difference between a Podiatrist and Chiropodist? There is no difference between a Podiatrist and Chiropodist, just the name being updated to the more internationally recognised term Podiatrist. The main aim of a Podiatrist/Chiropodist is to assess, diagnose and treat abnormalities of the foot and lower limb. They are trained to help alleviate, correct and prevent all foot problems and provide professional advice on footcare for all ages. Podiatry is a constantly evolving profession and it can take between 3-4 years to gain the Bsc (Hons) degree qualification. 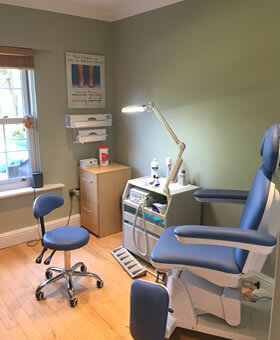 Both Podiatrist and Chiropodist are legal terms and have relevant insurances, which can only be used by professionals who have the required qualifications and are registered with the Health & Care Professions Council (HCPC). The HCPC regulate and ensure all members meet the required standards set by them and that the necessary insurances are in place. It is important that anyone seeking advice or foot treatment from a Podiatrist or Chiropodist must ensure that they are registered with the HCPC and have relevant insurances. Your feet hurt for a reason, don’t ignore the pain, seek professional help!